Ayang Rinpoche and the Amitabha Foundations worldwide have completed an extraordinary temple and retreat center in Nepal. 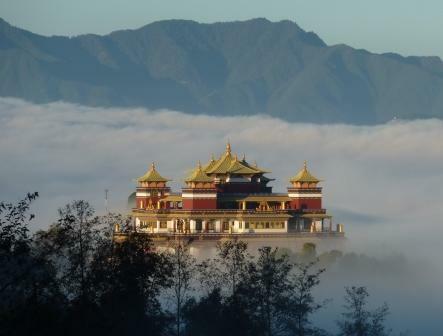 Located on a mountain top overlooking the Kathmandu Valley, the temple is visible from near and far. It is designed like a great mandala. The main temple, dedicated to Buddha Amitabha, is surrounded by 15 smaller temples and a retreat center. The temple and its facilities are open to lay visitors as well as Buddhist practitioners of all paths. More details about the temple and the ritual schedule being planned for visitors and retreatants are available here. A conference hall for the purpose of cultural exchange between the Eastern and Western worlds, a library, medical clinic, and an assistance center providing aid to poor people in the local community, have been planned into in the temple complex. Retreat Cottages: The retreat section around the temple will consist of 64 retreat cottages. These will bring the great benefit of intensive retreat practice to all Buddhist practitioners – lay and ordained, men and women. Anyone who sponsors a retreat cottage can do personal retreat for up to 40 months. See more details and benefits of sponsorship. Much of the retreat section still remains to be funded. Earthquake Repair: The main temple’s structure is now finished (see photos), however there was significant damage to many of the murals, which need to be repainted. Rinpoche is appealing personally for everyone with devotion to Buddha Amitabha to contribute as generously as possible to this project, which will long outlive all of us and will provide inestimable benefit to multitudes. If you would like to share in the merit of Rinpoche’s vast activities for the benefit of beings, donations can be made by PayPal or credit card below, or by sending a check made out to Amitabha Foundation, to P. O. Box 2572, Aptos, California 95001. Note that PayPal deducts a 3% fee, so for larger donations qualifying for a US tax deduction please donate by check.